Author(s): Camilla Thuring, Linda Geironson, Kajsa Paulsson. Immunology, Lund University, BMC D14, 221 84 Lund, Sweden. Human leukocyte antigen class I (HLA-I) molecules present antigenic peptides to cytotoxic CD8+ T cells. Downregulation of peptide:HLA-I complexes is common in tumors and results in tumor immune escape variants. Also molecules involved in the maturation of HLA-I have been demonstrated to be dysregulated in malignant neoplasms. We here set out to investigate the antigen presentation capabilities of a set of 12 glioblastoma multiforme (GBM) tumors based on the expression of HLA-I. 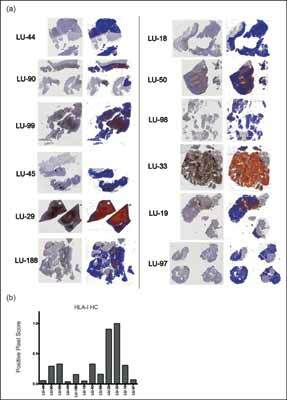 Moreover, we analyzed the expression of tapasin, a protein dedicated and essential to HLA-I maturation, as well as the infiltration of CD8+ cells using immunohistochemistry on paraffin-embedded sections. Comparison of different GBMs showed a variation in expression of both HLA-I heavy chain (HC) and tapasin. Interestingly, the expression of tapasin and HLA-I HC correlated significantly (p=0.0002) suggesting tapasin to be a key factor for efficient HLA-I antigen presentation in GBMs. Although no statistically significant correlation between CD8+ cells and survival was found, probably due to a very low number of infiltrating CD8+ cells at the time of surgical resection, both tapasin and HLA-I HC levels significantly correlated with survival. We suggest that analysis of expression of tapasin and/or HLA-I may be of value as prognostic tool for GBM patients, especially when considering immunotherapy. Keywords: Brain tumor, CD8, glioblastoma multiforme, HLA-I, MHC-I, tapasin. Affiliation:Immunology, Lund University, BMC D14, 221 84 Lund, Sweden. Keywords:Brain tumor, CD8, glioblastoma multiforme, HLA-I, MHC-I, tapasin. Abstract:Human leukocyte antigen class I (HLA-I) molecules present antigenic peptides to cytotoxic CD8+ T cells. Downregulation of peptide:HLA-I complexes is common in tumors and results in tumor immune escape variants. Also molecules involved in the maturation of HLA-I have been demonstrated to be dysregulated in malignant neoplasms. We here set out to investigate the antigen presentation capabilities of a set of 12 glioblastoma multiforme (GBM) tumors based on the expression of HLA-I. Moreover, we analyzed the expression of tapasin, a protein dedicated and essential to HLA-I maturation, as well as the infiltration of CD8+ cells using immunohistochemistry on paraffin-embedded sections. Comparison of different GBMs showed a variation in expression of both HLA-I heavy chain (HC) and tapasin. Interestingly, the expression of tapasin and HLA-I HC correlated significantly (p=0.0002) suggesting tapasin to be a key factor for efficient HLA-I antigen presentation in GBMs. Although no statistically significant correlation between CD8+ cells and survival was found, probably due to a very low number of infiltrating CD8+ cells at the time of surgical resection, both tapasin and HLA-I HC levels significantly correlated with survival. We suggest that analysis of expression of tapasin and/or HLA-I may be of value as prognostic tool for GBM patients, especially when considering immunotherapy.